‘There is a ‘power shift’ phenomena due to political and economic conditions among East Asian countries. Historic experience tells us that such a change in power balance leads to an instability of a region, so this tendency concerns us in the same way,’ says Prof. Takanori Kitamura. 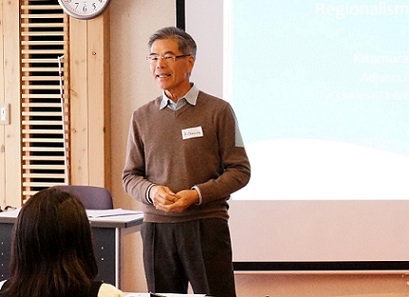 Prof. Kitamura was the instructor for the intensive course, “Exploring Regionalism in East Asia” in February. The course explored the issue of regionalism in East Asia through a comparison with the experience of other political regions such as the European Union. 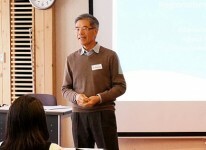 Prof. Kitamura teaches at the Chinese University of Hong Kong and specializes in political economy of East Asian region. 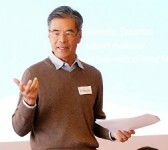 He has worked in China, the Philippines, Greece, Hong Kong, and at the United Nations Representatives in New York as in high profile diplomatic capacities such as the Japanese Ambassador and the Consul-General of Japan. In the intensive lecture, students were grouped as several country representatives to discuss ‘How to stop the nuclear expansion of North Korea’ in a model conference format, and explore the upcoming issues in the region.